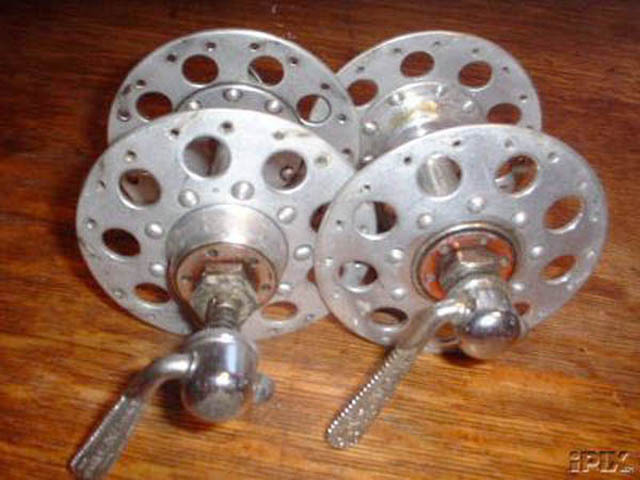 Maxi-Car - Rene Herse "grandes flasques"
Rene Herse milled down the flanges on stock high-flange Maxi-Car hubs (I presume this, rather than low-flange hubs, because there is no evidence of spoke holes on the remaining flange bits that the "grandes flasques" are riveted to - though I suppose that he could have gotten undrilled low-flange hubsets directly from Maxi-Car), and riveted his own milled, enormous flanges on to them. 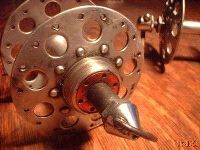 This is the same attachment method as seen with Prior hubs, and some early high-flange Atoms, as well as several custom French hubs I've seen. 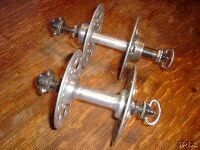 The flanges are immense, probably a good 2cm larger than the standard Maxi-Car high-flange hubs.